Create a stylish look in your child's bedroom with this twin size mate's bed base and bookcase headboard. Two drawers for storage under the bed is perfect are stowing away toys, clothing or other items. 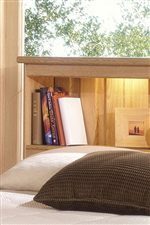 The Shaker Twin Bookcase Headboard w/ Mate's Bed Base by Lang at AHFA in the area. Product availability may vary. Contact us for the most current availability on this product. 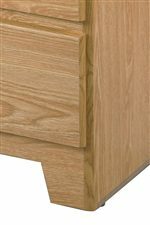 SHA-70-24077 2-Drawer Mates Bed Base with Roller Glides 1 40" 77" 12"
SHA-O-3/3BC8 Twin Bookcase Headboard 1 42" 8" 39"
Finish & Paint Options Select items in the collection are available in a variety of solid and two-tone finishes including Oak, Ray Oak, Hickory, White, Black/Hickory, Green/Hickory Blue/Hickory and White/Hickory. Handles & Hardware Each finish has coordinating hardware for a two-tone or monochromatic look. 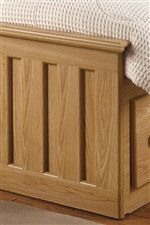 Case Detail Tapered legs and simple round moldings add simplistic elements to the arts and crafts style collection. Description: Top Fully finished tops complete each case piece.  Select items have contrasting finished tops. Warranty A 2 year limited warranty applies on drawers. If a drawer fails to remain in operational condition due to manufacturer?s defect, a new drawer will be sent directly to your home. Showcase the mission inspired style of the Shaker collection in your home. Drawing from arts and crafts style, the collection has simple designs accent by design elements like slats, panels, oversized tabletops and bracket feet. This bedroom collection consists of a variety of beds, chests, dressers, vanity sets, mirrors, a desk and a versatile nightstand so you can create your own bedroom set. 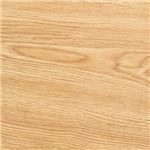 Choose to finish your items in one of several finishes, ranging from a casual oak finish to a contemporary monochromatic white design. Matching hardware adds further detail to each piece. With the simplistic look of the Shaker collection, you can add an accent chest to your existing bedroom set, or create a stunning bedroom set for your master, guest or child's bedroom. The Shaker collection is a great option if you are looking for Mission furniture in the area. Browse other items in the Shaker collection from AHFA in the area.